My brain melts into liquid every time I think about Diabolik Lovers. On the day when I decided to check which anime were included in the Fall 2015 cycle, my brain evaporated when I saw that some how Diabolik Lovers got a second season. I mean how on earth did this monstrosity of an anime get a second season, are there no other anime out there that need a second season? Like really, I can think of so many anime out there that are long overdue for a sequel. Maybe it's the fact that my brain evaporated that I somehow managed to get through watching Diabolik Lovers More Blood. The story continues in the same fashion as did the first and it gets more disappointing this season. So just when I think this anime could not get any worse, that bar sets a new level for itself. Four of these human-turned vampires kidnap Yui from the Sakamaki prison (yes, prison) and these guys relocated her into the Mukami prison. The anime explains in no detail how the Mukami brothers get turned into vampires nor what on earth this Adam and Eve storyline the Mukami brothers keep beating on and on about. For some reason the Mukami brothers need Yui for this Adam and Eve project, yet the anime goes into no detail on what that's about... sigh. At first I was like ok maybe since this season there's this constant talk about Adam and Eve, maybe More Blood has to do something with Adam and Eve from the Book of Genesis. But then I was like ok... I'm not sure how vampires fit in with creationism and the Book of Genesis. I guess explaining the plot was a failure yet again for this season. I don't get the popularity with Diabolik Lovers, Yui seems like she's this rag doll for these bloodthirsty men, and she just gives herself up with no form of retaliation. With the addition of the Mukami brothers, the way all of these men treat her really churns my stomach and makes me feel awful for her than I already did when I watched the first season. It got so bad this season to the point where it looked like the poor girl needed a blood transfusion...LOL. Overall, I just wish that I never started Diabolik Lovers. I have this weird habit of always starting something and having the need to finish it off. Thanks to that habit it looks like I'll be watching the third season of Diabolik Lovers. I'm assuming there will be a third season based upon the last episode where everything ends in a cliffhanger/ the plot stops halfway at the last episode. Somehow Diabolik Lovers got a second season, so now I'm mentally prepared that if a third season actually comes, I won't be surprised. 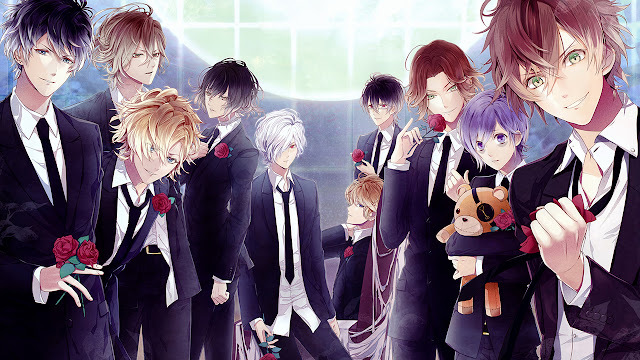 If you have not watched Diabolik Lovers before, stay away. You have been warned brahh. Well, good to know it doesn't get any better.